The bioprinting company says it plans a formal preclinical development program for 3-D bioprinted human liver tissue that could be transplanted into patients. Organovo officials within three to five years would like to submit an investigational new drug application to FDA for therapeutic bioprinted liver tissue, the San Diego-based company announced this week. The move comes two and a half years after Organovo started delivering 3-D bioprinted liver tissue for use in laboratory tests. "The scientific and commercial progress we have already made with ExViveTM human liver tiissue in drug toxicity testing has given us a firm foundation upon which to build a larger tissue for transplant," Organovo CEO Keith Murphy said in a news release. "Advancing our first therapeutic tissue into preclinical development is an important milestone for Organovo, and it speaks to the power of our technology platform in addressing multiple applications, including preclinical safety, disease modeling, and tissue replacement products for surgical implantation. We believe that 3-D bioprinted tissues have an opportunity to provide options for patients who suffer from liver disorders." The company has already seen strong results in preclinical studies with animals, which showed engraftment, vascularization, and sustained functionality of bioprinted liver tissue. The studies even showed stable detection of liver-specific proteins and metabolic enzymes. "In our preclinical studies, we deliver a patch of functional tissue directly to the liver, which integrates well, remains on the liver and maintains functionality. We believe our tissues have the potential to extend the lives of patients on liver transplant lists, or those who do not qualify for transplants due to other factors," said Eric Michael David, MD, Organovo's chief strategy officer and executive vice president of preclinical development. Organovo is also studying other bioprinted tissues that might be implanted in people, but liver tissue has been moving the most quickly through the development process. Discover the latest about connected medical device innovation at BIOMEDevice San Jose, December 7-8, 2016. European researchers are touting the first melt electrospinning printer that incorporates the use of bio-inks. The new machine from Swiss biomedical company regenHU is being housed at the at the Utrecht Biofabrication Facility in the Netherlands. Regenerative medicine scientists at Wake Forest Baptist Medical Center (Winston-Salem, NC) announced in February that they have created a custom-designed 3-D printer able to bioprint sophisticated ear, bone, and muscle structures. Researchers at Indiana University-Purdue University Indianapolis (IUPUI) and Johns Hopkins University are using a bioprinter that preserves cells better than the traditional scaffold 3-D printing technique, according to a report in TechRepublic. The robotic 3-D printer is called the Regenova. 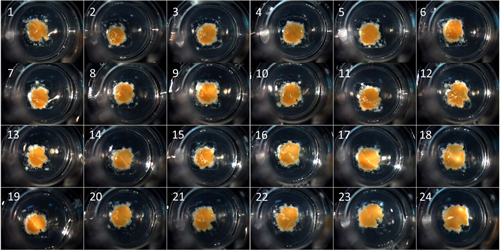 Made by Tokyo-based Cyfuse Biomedical, Regenova places groups of cells called spheroids in fine needle arrays, following pre-designed 3-D data. The cells then bond and fuse into tissue. At the AMBER material science center at Trinity College Dublin in Ireland, researchers have created a process to support larger and more complex 3-D printing of bone material.